Shiny Bike Syndrome started out as a motorcycle valeting business and has since expanded into providing cleaning products and accessories for bikes, as well as protective kit for riders. We created an early website for the company in 2011, but as the business changed the proprietor, Nigel Coulson, decided he needed to update the site. 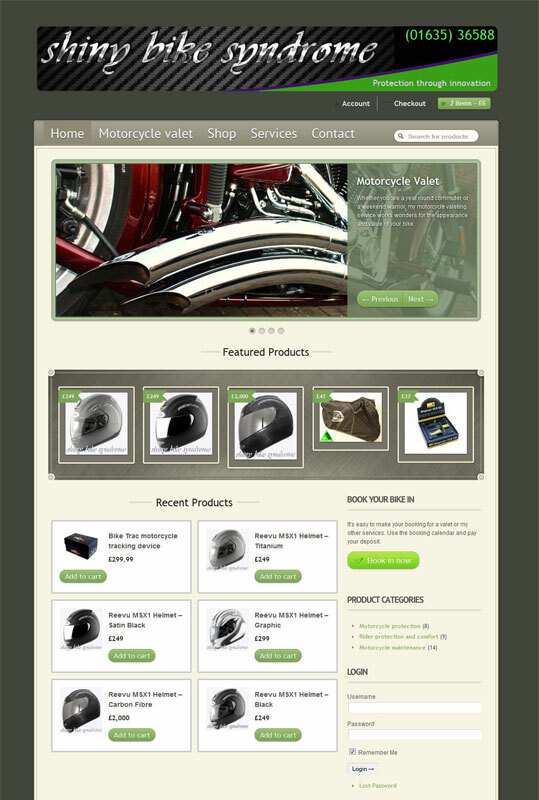 He also wanted a way to take deposits for valeting appointments via his website. We created a new webshop for his business and made it much easier for customers to use than the previous version, leading to an improvement in sales. While doing this we switched the site to the popular and flexible WordPress platform, to make it easier to manage his shop. This meant we were able to bring the design of the site up to date, but we also put a lot of effort into optimising the site for search engines. The biggest factor was an online booking calendar which allows his customers to pick a date for their motorcycle valet and then pay a deposit. This has proved really popular with his customers almost immediately since launch. Because Shiny Bike Syndrome already had a working website, we built the site in a secret area and only put it live, replacing the original, when it was ready. This kept disruption to customers to a bare minimum. Nigel said: “I saw a noticeable increase in customer numbers as soon as the site went live – I wasn’t expecting anything like that to happen.